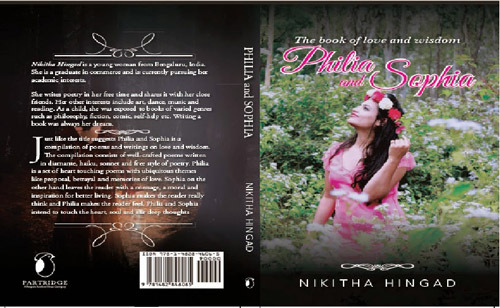 Description: Philia- Sophia a beautiful compilation of love and philosophical poems and writings by debutant writer Nikitha Hingad. The Book included around 60 poems and writings about love and around 70 of the same on philosophy. Nikitha has done a wonderful job of balancing these two diverse aspects of human lifestyle in her very first book. Combining the worlds of love and wisdom is no small feat and this is exactly what Nikhita Hingad, the young writer from Bengaluru, has achieved with her first book. The Philia section explores the various colors of love including, pain, betrayal and sadness. On the other hand, the Sophia sections expresses the writers views about a wide range of philosophical issues including beauty, trust, death, creativity and life itself. The diverse forms of writings used in the book add to its literal value and make it a perfect choice for someone like me who loves a lyrical poem almost as much as a free style one and devours on the enlightening themes of quotes, couplets and quadruplets. What I loved most about the book is that Nikhita has initiated the Philia section with a description of the concept that she has beautifully concluded with poem that is calling out to love. She has then gone on to describe the journey of love through her magnificent poems. I especially loved the poem “Love” where she tries to express the feelings of a desperate lover. I also liked “Break Up and Make Up” that tells the tale of the ups and downs faced by lovers. The pain expressed in “I feel like an empty cup” nearly brought me to tears, so strong was the impact of its words. The Sophia section is also initiated with an introduction of the concept and a poem calling upon the Goddess of wisdom for her blessings. The passion, with which Nikitha has written about even the most philosophical topics, simply warmed my heart. I just can’t appreciate her take on “Faith” well enough nor can I express my feelings of pride as I read “Being a Woman”. Her views in “Mental Block” and “A Treasure” turned me into a lifelong fan of this creative genius. I have to say that coming from someone who writes poetry in her free time, Philia- Sophia is a real gem. Even as this commerce graduate continues to pursue her academic interests, she has already produced a winner that is a perfect collector’s item for poetry lovers. Most importantly her creativity is not limited only to writing as can be seen from the several beautiful sketches that are found in the book. She is a perfect example of someone who has used her exposure to books of various genres at a young age to not only enhance her creative skills but express her thoughts in the most interesting and inspiring form of writing. I wish this young writer great success in her future endeavors and hope that she soon comes out with yet another inspiring book of her writings.